I’m being asked a lot of questions about how to actually make the cords used in a Handfasting. Here’s the way I do it. Firstly, don’t use ribbons unless you absolutely have to. They do not braid well and will blow away if left unattended at the altar unless you weight them down with something. Also they are flimsy to wrap. The upside of using them is that they are easy to obtain in almost any colour and they are easy to knot. I actually use the cords that are designed for macrame or heavy embroidery. You can get them in many colours and they are stiffer than ribbons. This makes them very easy to wrap and to braid, also they will bear up better to addition of charms, little bags and bells. Step 1. Decide what method of wrapping you are having. Is someone taking a cord, walking up to you and placing the cord around your hands? How many people are doing this? If it’s just the officiant your options are simple, you can knot and braid a portion and have them wrap the colours while talking, or they can just wrap once and then say all the blessings. If many people are wrapping and you want them to place individuals cords, it gets a bit messy if pre-braiding or knotting is done. Once you have decided on the method of wrapping you can either make a decorative knot and then tie off the braids ready for wrapping or cut some cords to length for the ceremony. The knot you see to the left is pretty much an expanded Josephine Knot, and I recommend making the knot with one piece of cord to get the positioning right, and then just follow through with the other cords, threading through with each colour individually does take a little time but gives a better finished product than does adding all the colours at once. Make your knot, braid a little of the cords, then leave a good 24 inches of hanging threads to wrap around the hands. Wrap and make a big knot. Once the ceremony is over and the hands extracted from the cords [if you wrap in a figure 8 pattern, you won’t have any trouble with this] braid the rest of the cords below the knot and add in any embellishments such as charms and bells. I sometimes finish the cord at the wedding if there is time while photos are being taken, but if I can leave at this point, I complete the knotwork at home and mail to the couple later. I loved the video. 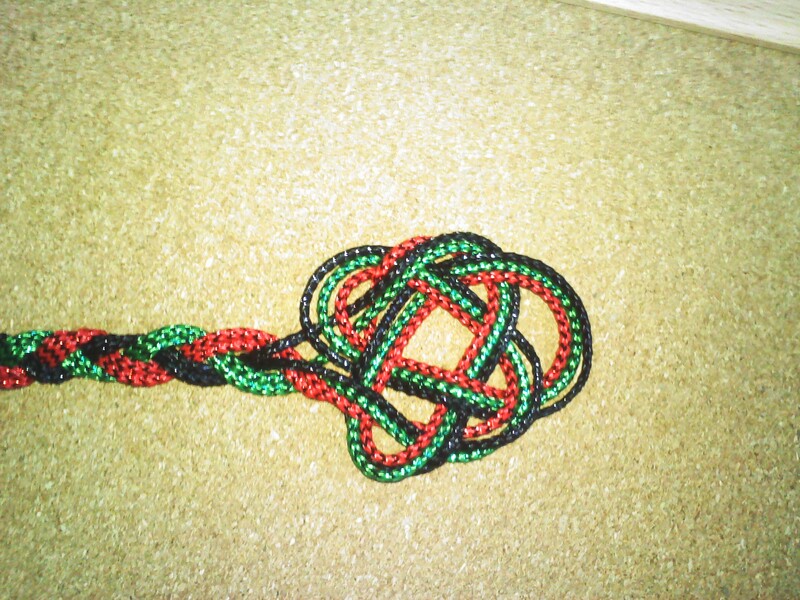 Cn the Celtic Tree of Life knot be made into a handfasting cord with multiple Celtic Tree of Lite knots? One after the other or would grading be needed in between? Glad you liked it. :-)The video was not made by me. The credits are on it. However, when I make my cords and I want to add elements that may be difficult to blend in, I either try to bind the cords together and proceed as if they were fresh unknotted cords and remove the binding later, or I make the knot in a separate cord and weave it into the main cord. In this fashion you could make a handfasting cord of multiple styles of knots with some creative weaving.